Our Homemade Yeast Rolls or Bread Recipe has consistently been our #1 recipe through the years. I have to say, it’s #1 in my book too, as I have honestly never had it fail, and it never fails to impress as well. I know several people that have wanted to try the yeast rolls recipe, but they’re still wary of working with yeast and think they’ll end up with dead yeast and hockey pucks. 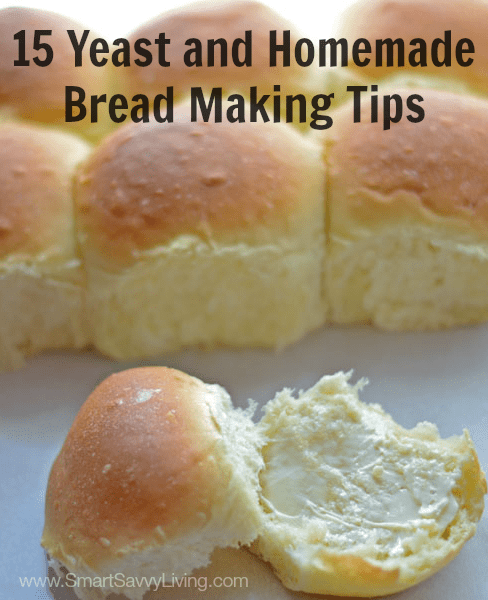 There’s nothing to fear, though – you too can have delicious fresh bread with these yeast and homemade bread making tips just in time for the holidays! 1. If you plan on making a lot of bread or other recipes with yeast, it is much more frugal to buy bulk yeast. After opening the package, put into a freezer-safe baggie or container and stick in the freezer to lengthen the life of the yeast. I have been using mine for over a year now. One packet of yeast = 2 1/4 teaspoons (though honestly I just usually bump it up to 1 Tablespoon, which is 3 teaspoons). Frozen yeast can be used immediately. You can buy instant yeast for faster results, but I like the result from regular yeast more. 2. Always bloom your yeast to make sure it’s still alive. Do so by adding the amount of yeast needed to warm water (about 1/4 cup, depending on the recipe), stirring to dissolve the yeast and allowing it to sit for 5 minutes. You’ll usually almost immediately see bubbles forming and if you still don’t see any after 5 minutes your yeast is either dead or your water was too hot and killed it. 3. Be mindful of your liquid temperatures. The optimal water temperature for yeast is 105-115°F. At temperatures above 120°F yeast will start to die. If you don’t have an instant-read thermometer to use, I always just run the sink until it’s warm and fill the cup, sticking my finger in and making sure it’s warm yet comfortable enough to keep my finger in for several seconds. 4. Adding honey or sugar to yeast and water can help it grow as it blooms. However, don’t add salt directly to the yeast and water as it can inhibit growth or even kill the yeast. 5. When kneading the dough, use as little flour as possible. Exact flour needed will depend on the humidity of the day and even the flour you use. If the dough is overly sticky (leaving your hands looking like a dough monster or not forming a ball that clears the bowl of a stand mixer), add a couple tablespoons of flour at a time, kneading until flour is fully absorbed before adding more. I used to do all my kneading by hand on Silpat mats to not make the counter a total mess, but since I got my KitchenAid Stand Mixer, the job is really a breeze and a lot less messy. 6. How do I know if I need to knead my dough more? Under-kneaded dough may look shaggy and will tear easily when you pull on it. If it also really sticks to your fingers when pulling on it, more flour is needed. 7. When has my dough been kneaded enough? Dough that has been kneaded enough should appear smooth, hold it’s shape when you shape it into a ball in your hands without falling between your fingers, and feel elastic when you pull on it without breaking. The general rule for kneading time is 6-12 minutes by hand and 4-10 minutes in a mixer, so odds are if you’ve kneaded on the high end of these times, it’s done. 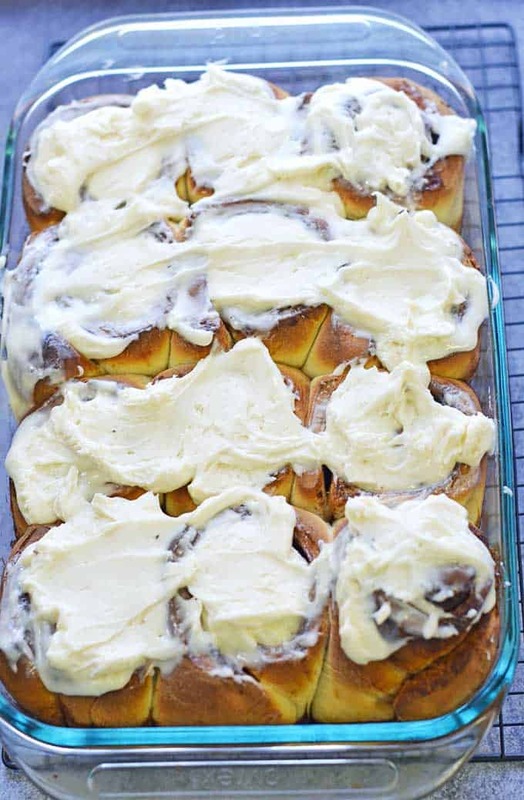 Weekend breakfasts don’t get much better than fresh homemade cinnamon rolls with cream cheese frosting! 8. When letting dough rise, be sure to coat the bowl with oil, flipping the dough in the bowl so it’s coated on each side (when I use my mixer, I just pat the dough down in the mixing bowl) and cover with a clean towel or plastic wrap. Not covering the dough can lead to dried out dough. You may also use a slightly damp towel to keep dough moist if it’s a really dry day. 9. Dough will generally take around an hour to double in size at room temperature (depending on type of yeast sed). I like to use a tall, large measuring cup to be able to easily tell when the dough has doubled in size. To expedite rising, heat your oven on the warming cycle or 150-200° for 2-5 minutes while kneading. Turn off the oven and place covered dough inside to rise for 30-45 minutes. 10. How do you know when bread dough has risen enough? Dough should be at least doubled in size and if you press two fingertips into the dough to about an half inch, the indention should remain when you remove your fingers. Indention should also remain for the second rising. Dough can rise too much, so if you’re not using it immediately, refrigerate it for up to 3 days, punching down as needed or freeze otherwise. 11. Make sure to use a properly sized baking vessel for your bread. Rolls do best in a pan with high sides with just enough room for the rolls,which helps the dough rise, like a 9 x 13 pan , while loaf pans (I use these pans a ton and they have lasted wonderfully for years!) need to be large enough to accommodate the amount of dough. If you do like crustier bread, you will want to use a low-sided pan. 12. Always preheat the oven before baking your bread and use the correct temperature. Otherwise, the bread may burn out the outside and be raw inside, not finish rising properly or have poor texture. 13. Your bread is done baking when the crust is nicely brown, it sounds hollow when you tap on the top, or bread has an internal temperature of 190-200°F (measure temperature from the bottom so it still looks nice on top). 14. Immediately remove bread from pan when it’s finished baking so the bottom crust doesn’t get soggy. 15. Loaves with a harder crust can be stored cut-side down without wrapping (wrapping will soften the crust). Softer breads should be wrapped in wax paper, plastic wrap, a plastic bag or bread box. Leftovers may also be frozen. I love making loaves and any leftovers that get stale get turned into croutons or breadcrumbs. I also make some the day or two before Thanksgiving to use in my favorite corn bread dressing recipe. Also make sure you have a good bread knife – many other types of knives will just squish the bread you worked so hard on! Bonus: Don’t forget to set out a stick of butter when you start your dough. There’s little sadder than fresh warm bread but no butter to spread it on! I know these tips may seem overwhelming, but they really become second nature quickly. Overall, the best tip is to keep making bread as I honestly think the biggest help is learning to get the feel for the dough. What are some of your yeast dough and bread making tips? how does the dough hold up to freezing? i would like to make the dough in advance then pull it out when needed. I have not frozen this dough, but I think it should hold up just fine. I would probably freeze before shaping and wrap it in plastic wrap and then stick in a plastic baggy to freeze. Then let it thaw completely before using. If you give it a try, let me know how it works out for you!